Maybelline Clean Express Waterproof Eye Makeup Remover - Go from Fierce to Fresh-Faced...Fast! Oil-free, dual phase formula leaves no greasy residue. Quick dissolving power with no harsh rubbing. Revolutionary quickbreak formula instantly removes even the most stubborn makeup. Dual-phase formula breaks up even longwear and waterproof makeup, and removes instantly. Oil-free. Ophthalmologist tested. Allergy tested. Safe for contact lens wearers and sensitive eyes. For best results, shake well. Apply with a cotton pad or tissue, then wipe across closed lids and lashes to remove eye makeup. Gently rinse with warm water. I have been using the Maybelline Clean Express Makeup Remover for a while and almost forgot about reviewing it until now. This is a biphase makeup remover - translation, there are two layers of liquid in this floating over each other, and you need to give the bottle a good shake and ensure this is mixed before use. I use this as directed, dispensing a generous amount on to a cotton square, holding it in place to let the makeup soak a bit, and then sliding it off and taking off the makeup. 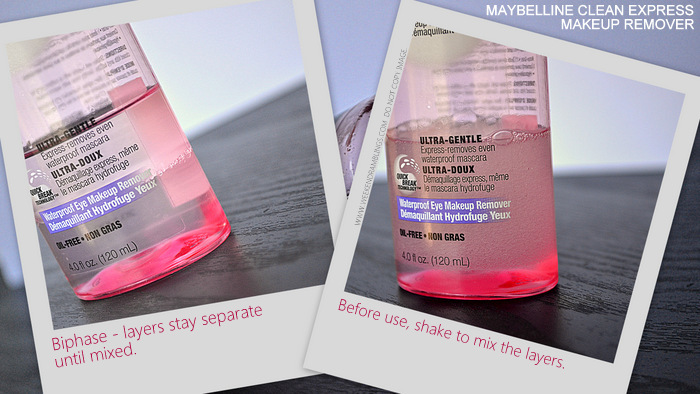 The Maybelline Clean Express Waterproof Eye Makeup Remover does an awesome job of removing my eye makeup. I don't use much waterproof makeup, and the only product that I can test this claim on is UD Glide-On eyeliner. Maybelline Clean Express has no difficulty that that off. I do find this a gentle/mild product, and I would recommend just holding the cotton square soaked in the remover pressed on the lids just for a teeny bit so the makeup gets soaked and slides off easier, instead of trying to rub the makeup out. This does leave a bit of an oily residue, and sometimes it can accidentally get into my eyes and cause an oily irritating film - but I haven't had any eye irritation with this so far, and everything gets washed away easily when I wash my face. This would definitely be my pick for a good drugstore eye makeup remover.